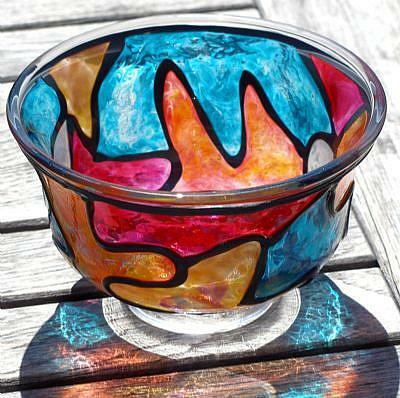 This is a lovely stained glass painted fingerbowl (small bowl) that has a pedestal foot on it. It measures approx. 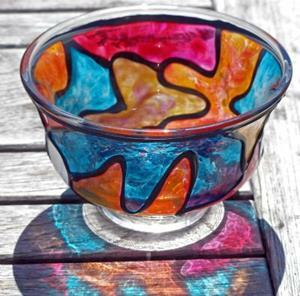 3.5"Height x 5.5"Width and can be viewed as a gorgeous, yet functional piece of art. I would consider this stained glass painting method "cold" glass work. It can be used to store any small items inside, (such as candy) and set it on a coffee table, shelf, windowsill or as a centerpiece on a dining or console table or even on a buffet sideboard to display. 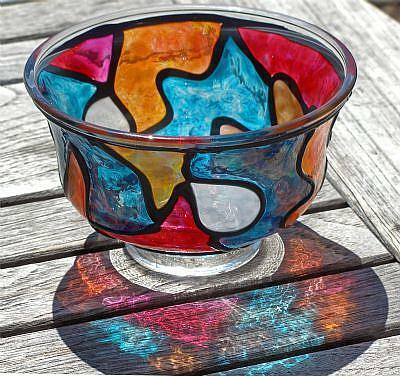 When the sunlight shines through the colors, it will cast lovely colorful shadows as seen in the photos here. (I photographed this piece in the very bright sunlight so as to capture the beauty of the stunningly colorful cast shadows here as well as the beauty of the actual piece). I wanted this piece to be a center of attention type of accessory, so I decided to put a modern abstract spin on it, and just went wild with color. This piece is truly a stunner in person! The colors just hit you, and no matter which angle you view it from there is color everywhere! This piece would look fabulous in any window of any home or office. 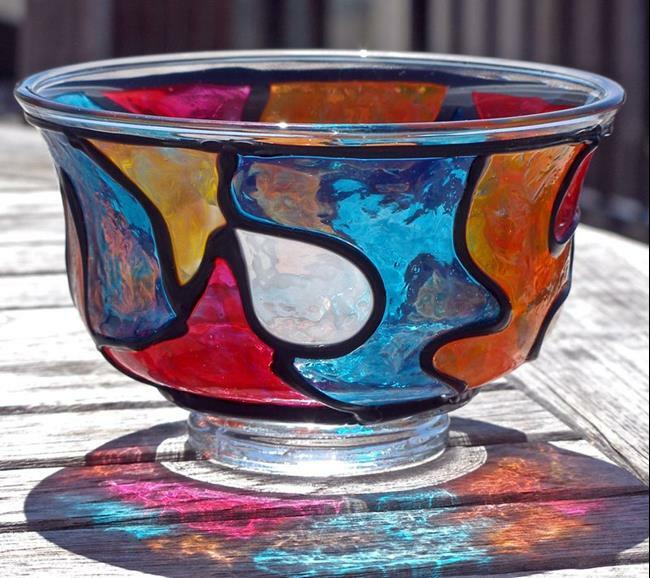 It features stunning, gem like colors in jewel tones that have a beautiful translucency or iridescence to them. I achieve this look by mixing 2 or more colors together in each section. I call this piece "As Deep As The Ocean" because the pretty blue-green/turquoise color reminds me of the sea. I also used a magenta color and orange and white to create the abstract design. The technique I use to create this piece is as follows: First, I lay down the black "liquid leading" outlines. Then after those are dry (overnight), I apply the colors to each individual section, meticulously with a toothpick(! ), using it to blend and spread the colors all the way to the edges of the black outlines, making sure to pop any bubbles that occur along the way. Then, when I am satisfied with all the color it is left to "cure" or dry for about a week. Then it is done and ready to be displayed in your home!